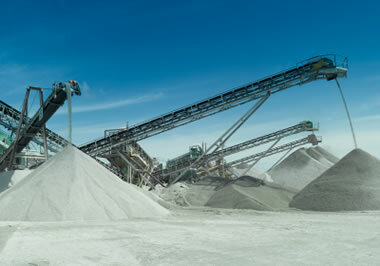 Used in monuments, crushed stone, cosmetics, pharmaceuticals, and more. 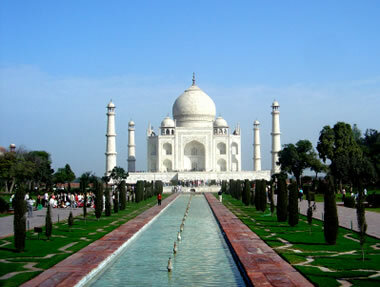 The Taj Mahal is one of the most beautiful and famous buildings in the world. It was built between 1632 and 1653 as a mausoleum for Mumtaz Mahal, the third wife of Mughal emperor Shah Jahan. Marble was used extensively throughout the building, including the marble domes and towers. Photo copyright iStockphoto / standby. Very few rocks have as many uses as marble. It is used for its beauty in architecture and sculpture. It is used for its chemical properties in pharmaceuticals and agriculture. 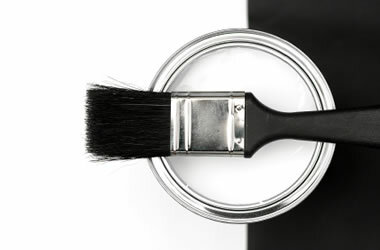 It is used for its optical properties in cosmetics, paint, and paper. It is used because it is an abundant, low-cost commodity in crushed stone prepared for construction projects. Marble has many unique properties that make it a valuable rock in many different industries. The photographs and captions below illustrate just a few of its varied uses. 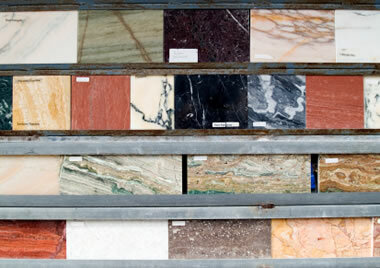 Marble occurs in a very wide range of colors. Marble formed from the purest limestones is white in color. Iron oxide impurities in the limestone will produce a yellow, orange, pink or red color. Clay minerals can produce gray colors that often occur in bands after the compositional stratification of the original limestone. Abundant bituminous materials can produce dark gray to black marble. Marble that contains serpentine often has a green color. Photo copyright iStockphoto / Tina Lorien. 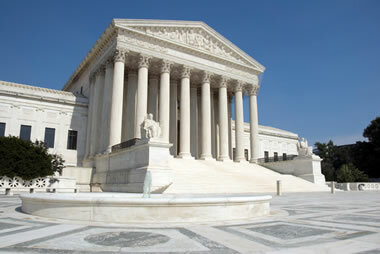 The Supreme Court building was constructed between 1932 and 1935 using several different types of marble. Vermont marble was used extensively in the exterior. The inner courtyards were made using bright white marble from Georgia, and the interior corridors and entrance halls are made from creamy white marble from Alabama. Photo copyright iStockphoto / GBlakeley. 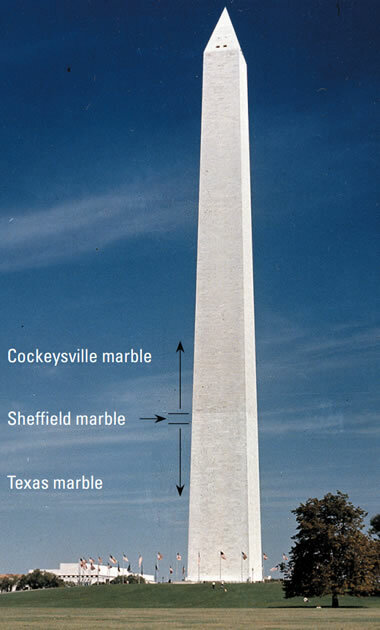 The Washington Monument was built of marble between 1848 and 1884. Initial work on the structure was done using marble from a quarry located near Texas, Maryland. The project was then delayed for nearly 30 years due to a lack of funds. When construction resumed in 1876, similar stone from the Texas quarry was not available, so stone from the Sheffield quarry near Sheffield, Massachusetts was used. The Sheffield quarry had problems delivering stone in a timely manner, and in 1880 their contract was cancelled. A new contract then went to the Cockeysville Quarry near Baltimore, Maryland which supplied a slightly darker dolomitic marble. These different stone sources can be seen in the monument as labeled in the photo above. Photo and annotation by the United States Geological Survey. Marble is a material used in prestige architecture and interior design. 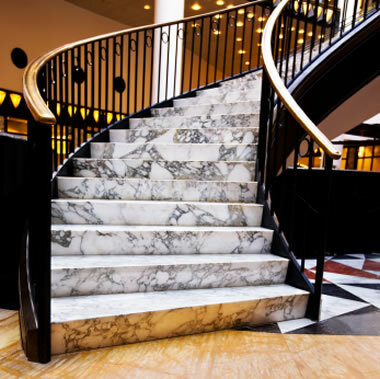 This photo shows stair treads and risers made from brecciated marble and floor tiles made from marble in a variety of colors. Photo copyright iStockphoto / Nikada. Marble is a translucent stone that allows light to enter and produce a soft "glow." It also has the ability to take a very high polish. These properties make it a beautiful stone for producing sculptures. It is soft, making it easy to sculpt, and when it is fine-grained it has uniform properties in all directions. Some of the world's most famous sculptures have been produced from marble. 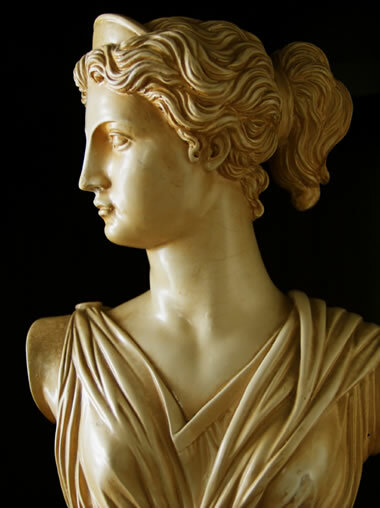 This bust of the Greek goddess, Artemis, is a copy of an original Greek work. Photo copyright iStockphoto / Diane Diederich. 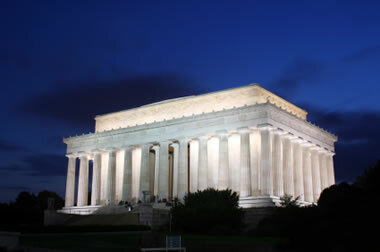 The Lincoln Memorial was built between 1914 and 1922. Many different stones were used in the memorial. The terrace walls and lower steps were made of granite from Massachusetts. The upper steps, columns, and outside facade were made using marble from Colorado. The interior walls are Indiana limestone (called "Indiana Marble" by many architects). The floor was made using pink marble from Tennessee, and the statue of Lincoln is made from a very bright white marble from Georgia. Each type of stone was selected for its properties along with an effort to utilize stone from many parts of the United States. Photo copyright iStockphoto / ntn. 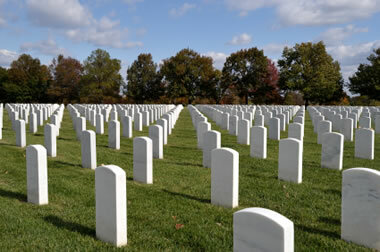 Marble is often used as a cemetery marker. It is a very attractive stone. It is economical because it is relatively easy to cut and engrave. In comparison to rocks like granite, it is not as resistant to acid precipitation and tends to lose edges and detail over time. Photo copyright iStockphoto / JPecha. 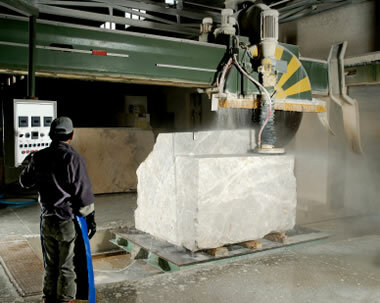 A large-diameter diamond saw cuts a block of marble into dimension stone at a factory. Slabs and blocks of marble are used for stair treads, floor tiles, facing stone, cemetery stones, window sills, ashlars, sculptures, benches, paving stones and many other uses. Photo copyright iStockphoto / maskpro. Some marble is heated in a kiln to drive off the carbon dioxide that is contained within the calcite. 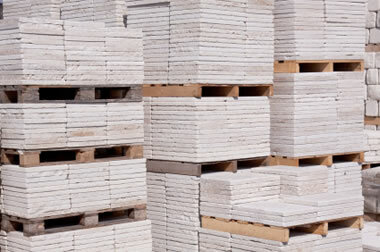 What remains after kiln treatment is the calcium oxide - known as "lime." Lime is used as an agricultural soil treatment to reduce the acidity in soil. When applied in combination with fertilizer, it can increase the yield of a soil. 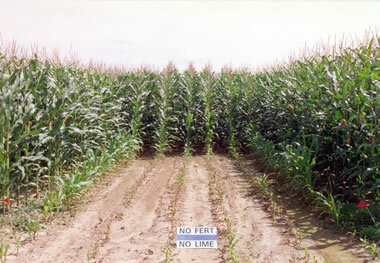 This test plot shows a portion of a corn field where no lime and no fertilizer were applied. The plants in that plot are struggling to survive. Photo by the Agricultural Research Service, United States Department of Agriculture. Marble cut into blocks and slabs of specific size is known as "dimension stone." Photo copyright iStockphoto / Thomas Lehmann. Equipment working in a marble quarry near Madrid, Spain. 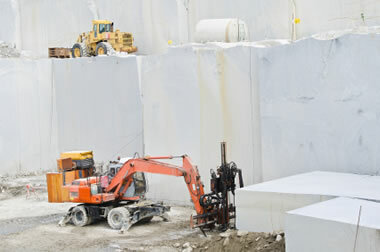 In this quarry the marble is being sawn into blocks for the production of dimension stone. Photo copyright iStockphoto / vallefrias. Marble is composed of calcium carbonate. That makes it very effective at neutralizing acids. 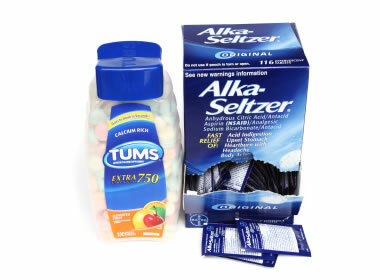 Highest purity marble is often crushed to a powder, processed to remove impurities and then used to make products such as Tums and Alka-Seltzer that are used for the treatment of acid indigestion. Crushed marble is also used to reduce the acid content of soils, the acid levels of streams, and as an acid-neutralizing material in the chemical industry. Photo copyright iStockphoto / NoDerog. Some marble is mined, crushed, sized and sold as a construction aggregate. It can be used as fill, subbase, landscape stone and other uses where soundness and abrasion resistance are not critical. Because marble is composed of calcite, it cleaves more readily than limestone and does not have the strength, soundness, and abrasion resistance of granite and other more competent rocks. Photo copyright iStockphoto / AdShooter. Marble is composed of calcite, a mineral with a Mohs hardness of three. 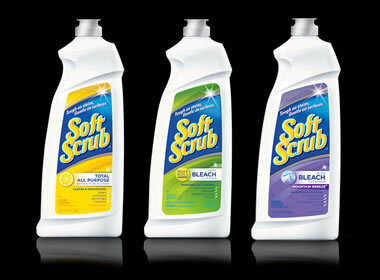 It is softer than most bathroom and kitchen surfaces and can be used on them as a scrubbing agent without producing scratches or other damage. 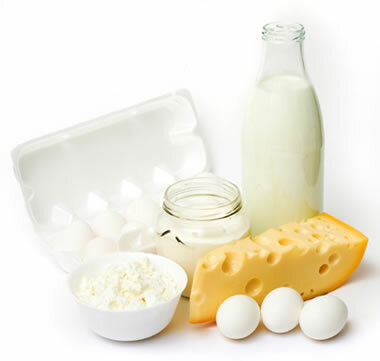 Dairy cows and chickens need a steady supply of calcium to produce milk and eggs. Farms that raise these animals often use animal feeds that have been supplemented with additional calcium. Powdered limestone and marble are used to produce these supplements because they are softer than the animal's teeth, soluble, and rich in calcium. Photo copyright iStockphoto / NiDerLander.